Little Miss Three is on a mission. She marches down a line of Pink Lady apple trees, examining every piece of fruit within toddler-reach, tut-tutting over less-than-textbook specimens and plonking those that meet her approval in a basket. I bend down to explain to my granddaughter that, when it comes to fruit, perfection is in the taste, not appearance; so to test my theory, she proceeds to try the merchandise before sale, biting into the little balls with a satisfying crunch. Yes, this is the ambrosia that tempted Eve – crisp, sweet and delicious – not the floury, cold-stored mass-produced freaks sold in supermarkets. 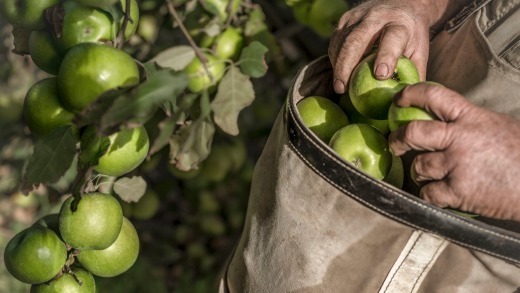 There's nothing like plucking an apple straight from a tree to remind us just how good food is supposed to taste – not to mention it being an enjoyable activity for the whole family. We have joined the throng discovering this simple pleasure at Bilpin, on the western fringes of the Blue Mountains. Verdant and emerald green, with a cool, misty microclimate, this pretty strip on the Bells Line of Road 90 minutes from the CBD has long been known as Sydney's fruit bowl, producing stone fruit, figs, persimmons, pears, blueberries and chestnuts, as well as several varieties of apples. There are at least six orchards open to the public in the area, with farm gate sales and pick-your-own visits increasingly popular during the peak season of January to May. 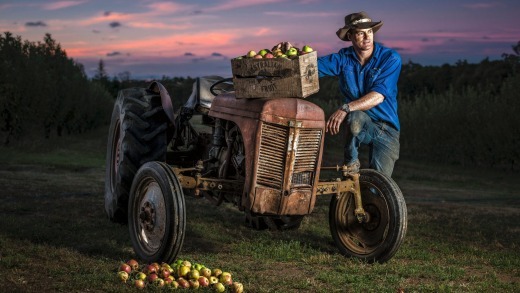 Other establishments in Bilpin are famed for their apple pies, opening year-round on weekends; while the most recent by-product to take off is cider, with two acclaimed local brews, Bilpin Cider and Hillbilly Cider, establishing their own cellar doors and tasting rooms. Easter, as we discover, can be quite chaotic as families descend on the Blue Mountains for school holidays; but after jostling for parking space outside Shields Orchard, we alight to azure skies, glorious warm sunshine tempered by a pleasant mountain chill, and the tinkling of bellbirds in towering gums. Who said country life isn't good for the soul? Inside a ramshackle corrugated iron shed we meet Bill Shields, an apple grower who has lived on this six-hectare property for more than 50 years, following in his grandfather's footsteps as a fruit producer. The orchard has been open to the public since 1955, with the pick-your-own option, introduced in the 1990s, helping to keep small farmers like the Shields in business in an ever-tightening market. "It's really popular with families, especially those from overseas. 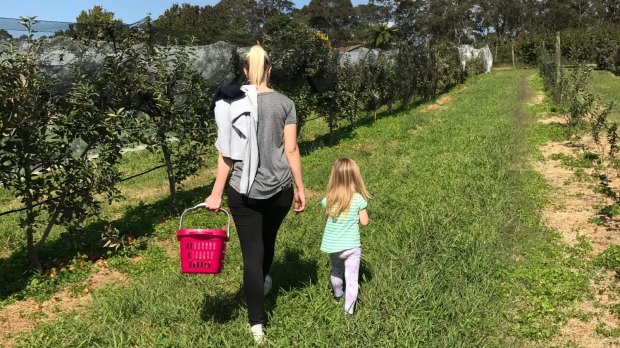 Some of those children don't even know that apples grow on trees, and to be able to run around and pick fruit and be in the fresh air is a real novelty to them," Bill tells us as he hands little Ellie a pink plastic basket and points her in the direction of the apple trees. During our visit, Granny Smiths and Pink Ladies are in season; but there's one variety of the 14 grown on the property that Bill is particularly proud of. "This is the Julie, named after my wife," he tells us, slicing into a large, beautifully red, slightly speckled apple. "Well, with a name like that, it must be good," I joke, tucking into my namesake. It is. Sweet, crisp, with just a hint of berry-tartness. Perhaps pineapple. Or pear? Certainly something indistinguishable, a taste sensation. "This is the first chance, cross-pollinated seedling grown in the Sydney Basin since the Granny Smith, which dates back to the 1860s," Bill tells me. "We found it here on this property over 20 years ago, and now it's being produced around the world. It's been trademarked as 'Julz' in over 46 countries." While Bill holds hope that his Julie apple will be the next big thing in fruit, it's already made its mark in the cider world, with Hillbilly Cider's Sweet Julie – made with fruit from Bill's orchard – awarded Best in Class at the 2016 Australian Cider Awards. This delicious summer drop, described by Real Cider Reviews as having "bucketloads of flavour without being sickly sweet" is made – like its other Hillbilly stablemates Crushed Pear, Scrumpy, Apple, Non-alcoholic Apple and Vintage – from 100 per cent crushed fruit, with no added sugar or artificial flavours, by fellow Bilpinites Shane and Tessa McLaughlin. It's a marriage made in fruity heaven; and a local success story that does the little mountain community proud. And to take these nuptials one step further, Shields and Hillbilly Cider have, quite literally, shacked up, with Shane and Tessa opening a cellar door on the back deck of Bill's old packing shed. Now, while the kids frolic in the orchard and pick their own school snacks, the adults can kick back in the sun with cider tastings and direct sales. Life in the Big Apple is sweet. Bilpin is located 90 minutes' drive from Sydney, on the Bells Line of Road between Richmond and Lithgow. Apple picking season is from January to May, though it's advisable to call ahead to find out what is in season. The Hillbilly Cider Shed is open year round from Friday to Sunday, 11am-5pm. 2270 Bells Line of Road at Shields Orchard. Picking apples at Shields is free, buy what you pick for around $2.70 a kilo.